Currently, Our generations will depend on the social network . in this Century we all are communication on facebook. 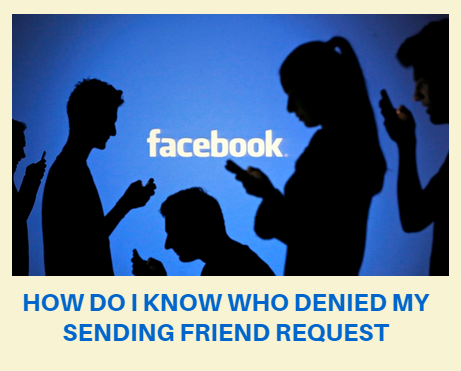 To communicate and connect with new people is a big challenge on facebook.Today my topic is how to know who denied your sending friends request -- facebook add friend greyed out. I sent a request last 4 days ago ; I will see there is no notification about this contact request. I'm not sure what happened behind. After a few days, I will go to her profile shows me same options add friend. I'm confused is there anything wrong. may be friends request not sending I will send again after few days I will see the same option. So what is wrong ? is there any sending problem or he/she reject my friends request. This is an importance question? How to know who reject your friend request. However, this not a hard work to find who reject your friends request. Facebook has this option here in this list you will clear about your request rejection. However, you will not see any rejection reason here just know you will be rejected. First Login your facebook account. This will open a page under your account. Now let's start here you will see this page "Friend Requests Sent" that means here you will see a list by sending your side here listed all people do not accept your request that's mean's you will pending on her friend's list. Besides if you did not find their name isn't among the pending requests shown on this page list, they likely denied your request. So now you clear the person to reject your request. Type the name of the person you friend requested into the "Search" box at the top your Facebook account's homepage. Click the name of the person you friend requested. Look at the gray button next to the person's name. If the button reads "Friend Request Sent," the person has not yet accepted or declined your friend request. If the button reads "+1 Add Friend," the person denied your friendship request. Tips: I suggest before sending friend request. You may send a message and explain yourself in short MSG. If the person replies your MSG, then you will send a request.